RONNIE O’SULLIVAN NEEDS only three more frames to win the Betfred World Snooker Championship, as he leads Ali Carter 15-10 at the Crucible. The Rocket – who says he could announce his retirement at the end of the tournament – started the third session with a 10-7 lead and came out with a blistering start. 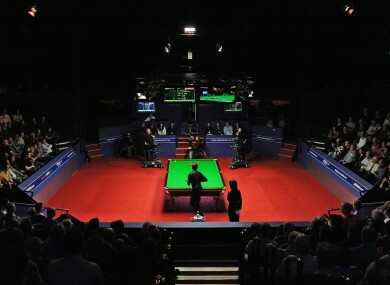 O’Sullivan made a break of 101 to go 11-7 up, before rattling off three more in the run-up to the mid session interval. Carter pulled off a stunning red on his way to his first frame of the day, in frame 22, and followed that up with his first century of the final. Finally, the Captain had taken flight, and he reduced the arrears even further with his third frame in a row to make it 14-10 when O’Sullivan conceded. However, the three-time champion finally rediscovered his touch to take the final frame of the afternoon, and has a sizable advantage going into Monday night’s deciding frames. Email “O'Sullivan stretches lead to 15-10 in World Championship final”. Feedback on “O'Sullivan stretches lead to 15-10 in World Championship final”.